Jurassic Jackpot Classic Slot Guide & Review - Casino Answers! Jurassic Jackpot is a 3-reel, 1-line classic slot machine, featuring a wild symbol and multipliers. You can play the Jurassic Jackpot classic slot machine at Bovada. Bets on the Jurassic Jackpot slot machine are $0.25, $0.50, $1, $2, $5, $10, $20 and $25. You can bet 1 or 2 coins per spin. You can bet as little as a quarter per spin up to the highest total bet of $50 per spin. For a classic slot, this is a very wide betting range that is suitable for both casual players and high rollers. 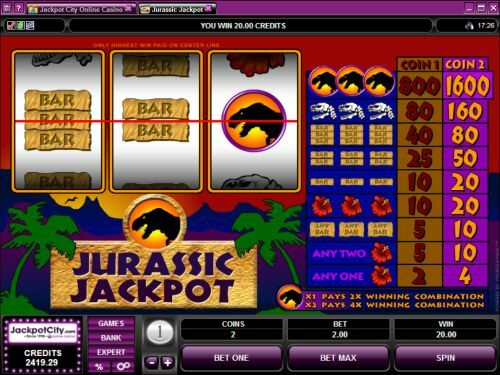 To play the 2-coin maximum bet on the Jurassic Jackpot slot machine, hit the “Bet Max” button. For all other bets, you can select your bet and hit the “Spin” button. The highest paying symbol on the Jurassic Jackpot slot game is the T-Rex symbol. If you hit 3 T-Rex symbols on the payline on a maximum bet, you will win the 1600 coin top jackpot. The T-Rex symbol is a wild symbol that will act as a 2X or 4X multiplier for 1 or 2 symbols. You can win the top jackpot when you play Jurassic Jackpot at Bovada. There are 9 winning combinations on the Jurassic Jackpot classic slot machine. The complete payout schedule is as follows (1/2 coin payouts in parenthesis): 1 Flower symbol (2/4), 2 Flower symbols (5/10), any 3 Bar symbols (5/10), 3 Flower symbols (10/20), 3 Single Bar symbols (10/20), 3 Double Bar symbols (25/50), 3 Triple Bar symbols (40/80), 3 T-Rex Skeleton symbols (80/160) and 3 T-Rex symbols (800/1600). You can hit the “Expert” button to access Jurassic Jackpot’s autoplay mode. You can play 5 or 10 autoplay spins or hit the “Auto Play” button to open up advanced settings. You can play 5, 10, 25, 50, 100, 250 or 500 autoplay spins and set the number of seconds between spins at 0, 0.25, 0.50, 0.80 and 1.50. Stop settings include stop once all spins are complete, stop when jackpot is won, stop if a win exceeds or equals ($25, $50, $100, $250, $500, $1000 or $2500), stop on any win and stop if credits increase/decrease by ($25, $50, $100, $250, $500, $1000 or $2500). You can stop autoplay on Jurassic Jackpot at any time. Jurassic Jackpot is a solid classic slot. There are no blow away special features or anything like that, but if you want to play a dinosaur classic slot, you should be satisfied with the Jurassic Jackpot slot game. You can play the Jurassic Jackpot slot machine when you sign up and make a deposit at Bovada! Can players from the United States play the Jurassic Jackpot online slot? Unfortunately, American players cannot play the Jurassic Jackpot slot machine for real money. American players can play the One Million Reels BC Progressive Jackpot Slot for an alternative. Can I play a free Flash game of the Jurassic Jackpot slot machine? Yes, you can play the Jurassic Jackpot slot game for free at Bovada. You can play for free or real money. If you experience any issues with the Flash software, make sure you have the latest version of Adobe Flash Player installed on your computer.